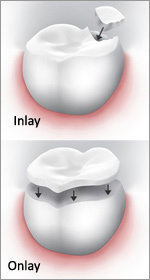 Inlays and Onlays | Eastern Long Island, NY | Joseph F. Sciotto D.M.D. There are so many procedures that repair damaged teeth today. So… how do you choose? With the help of our knowledgeable and friendly dental staff here at Joseph F. Sciotto D.M.D., that’s how! There are many ways to restore damaged and decayed teeth – we can help you decide the best procedure for your teeth!